Diabetic nephro-sclerosis in the United States has been the primary cause of death in 50% of patients with Type 1 diabetes. 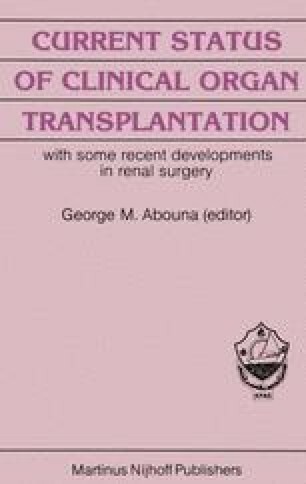 Diabetic nephropathy is now responsible for 25% of all new cases referred to transplant units in the United States (1). Average patient survival of diabetic patients maintained on dialysis is 60–70% at 2 years and this represents on improvement on the results obtained in the early 1970’s where only 25% of the patients were alive at 2 years (2). The results of maintaining diabetics on dialysis have improved tremendously (3) and this has also been paralleled by an improved survival after renal transplantation. It has been considered that the diabetic patient is a high risk patient for dialysis or transplantation but this is only in relation to the non-diabetic patient who receives the same treatment. It is important to consider what is the best treatment for the individual patient. Particularly since diabetic patients do better with renal transplantation then if they are maintained on dialysis. However, elderly patients tended to do better on dialysis rather than transplantation (in the pre-Cyclosporin era) and this group are therefore ‘high risk’ for transplantation.